Did you know this? That 88 Syrian soldiers were killed in that very early phase of the Syrian civil war? 5 years ago the Syrian „uprising“ or „revolution“ started in the city of Deraa. It is not much that we really know about the details and the dynamics that triggered the deadly cycle of cause and effects which – not long later – climaxed into a spirale of violence that now enters it´s sixth year. While it is true that security forces in Deraa strongly overreacted to youths spraying anti-government graffiti on the walls of a school by torturing some of them and insulting their parents when they protested against the treatment of their kids, this narrative which exclusively displays the opposition perspective of the events leaves other, less pleasant facts untouched. „According to several different opposition sources, up to 60 Syrian security forces were killed that day in a massacre that has been hidden by both the Syrian government and residents of Daraa. So, 50% of the casualties were soldiers of the army. Do you still believe that the „opposition“ was unarmed and peaceful? Considering this enormous death toll of the Syrian army, do you still believe that they „overreacted“? No country likes to have the media of hostile western countries on its soil, especially after Iraq 2003 and Libya 2011 blatantly showed how media deliberately misreported events, concealed „unfavorable“ facts and exaggerated/overemphasized other facts. The Syrian government had no interest in exposing weakness and revealing the degree of it´s loss of control in some cities. Western and Arab media and governments simply declared all reporting by Syrian and pro-Syrian sources „propaganda“ and treated every claim by Syrian „activists“ as undisputed truth. So, for many months the fairy tale was perpetuated of a population enduring it´s governments unlimited and unjustified violence peacefully and patiently until one day it had enough and decided to „defend“ itself. Some went so far to claim that this allegedly nonviolent phase of the „revolution“ lasted almost one year. This is a brazen lie. In a single incident in early June 2011 – note that this is less than three months after Deraa – some 120 soldiers and police were killed in the city of Jisr al Shughur. One thing is crystal clear: Syrias „uprising“ was armed and violent from its very first days. No doubt, many innocent people were killed by the security forces, but to claim that the violence was one-sided, that the protesters were unarmed and entirely peaceful, that police and army had no reason to resort to violence means ignoring the bitter truth of the not so romantic beginnings of what became a full scale armed insurrection. The Syrian state and army are sectarian…The state hates Sunnis…The rebels are fought because they are Sunnis…The CIVILIANS are deliberately killed, simply because they are Sunnis…THE GOVERNMENT AND ARMY (+ LOYALIST MILITIAS) ARE „ALMOST ENTIRELY“ ALAWITES WHO HATE SUNNIS, etc. Recently some western and Gulf Arab circles have been bringing up the idea to „reconsider“ the Nusra Fronts (Jabhat al Nusra) status as terrorist organization. They attempt to sugarcoat Nusra as „moderate Islamists“ who are supposedly the arch enemy of ISIS and therefore sort of „not that bad“. The argument is totally flawed as the Syrian army is also fighting ISIS in places such as Qalamoun, eastern Homs (Palmyra), Deir al Zour and Hasakah to name some of the battlefronts, not to mention that ISIS is fighting pro Assad factions in the Yarmouk camp of Damascus, where – interestingly – it was al Nusra who let ISIS enter the camp. This is exactly the point: Nusra harbors key non-Syrian radically sectarian elements, going from the Chechen commander Muslim Shishani to the Saudi Salafi „field ideologue“ Abdullah al Muhaysini. There have been dozens of cases of similar mass executions of „non-aligned“ civilians, including many Sunnis, by simply declaring them „loyal to the Syrian government“, as if this in itself is a grave crime. The international media has for years been very receptive and tolerant for Syrian rebel crimes as soon as the victims were defamed as „Shabiha“ or otherwise dehumanized. „Shabiha“, „Assad supporter“, „regime loyalist“, these and other negatively colored terms have been the standard vocabulary of Syrian rebels and their media mouthpieces when it came to justify terrorism and crimes against humanity. „The Nusra Front, concluded HRW, was „responsible for systematic and widespread violations including targeting civilians, kidnappings, and executions„. Like ISIL, the group has „committed systematic rights abuses, including the intentional targeting and abduction of civilians“ with „repeated claims of responsibility for lethal car bombing attacks that have targeted civilians in Syria„. The Nusra Front, HRW added, has – again, like ISIL – „imposed strict and discriminatory rules on women and girls and they have both actively recruited child soldiers„. So, a moderate or pragmatic group then? Not by any stretch of the imagination…. It was not Assad as „terror magnet“ that brought tens of thousands of international Jihadists to Syria, but Saudi and Qatari money, American, british and French weapons supplies and Turkish/Jordanian facilitations as border countries along with Israels not so covert sabotaging of Syrias military that allowed Jihadists to arm themselves, enter Syria and strengthen due to the weakening of the Syrian army. The US supports Israel, justifies and legitimizes its actions, delivers the weapons and resupplies the ammunition. Israel has used phosphorus and cluster ammunition against Palestinians. 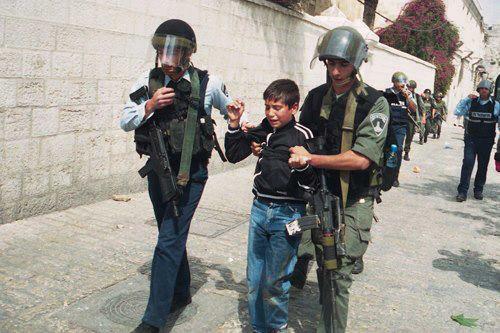 The Palestinian victims of Israels are not labeled „activists“, nor „freedom fighters“. They are not even called resistance fighters or rebels, they are TERRORISTS. The rise of sectarian radical islamists in Syria, both syrian and international Jihadists is neither a coincidence nor an „accidental“. It is according to a systematic long term plan to destroy pro-Russian and/or pro-Iranian governments opposed to Israel. The Syrian government brings all the ingredients to draw the wrath of the Americans, the Israelis and the Sunni Gulf states. The Americans and the Israelis – along with their European ever „yes saying“ allies – pretend to be moved by human rights violations, while everyone familiar with the fate of Palestinians since 1948 and that of the Iraqi since 1991 knows that both, the US and Israel, do not care at all for Muslim Arab lives. 2,5 months after the US began to bomb IS in Iraq and almost one month after the US and allies started an aerial bombing campaign against IS in and near Kobane in Syria it is not clear at all whether any real success has been achieved. In Iraq IS has again managed to put a siege around the Sinjar area and encircle the Yezidi inhabitants. In Kobane IS has lost a couple of hundred fighters but still in inside parts of the city and was even able to take back a „strategic hill“, which the Kurdish defenders just had recaptured 2 weeks ago as an alleged sign of the tide turning (against IS). 1. How is it possible that the most modern airforce of the world is not able (or willling?) to dislodge the 1000 (or so) fighters of a militia that has a dozen of old Russian tanks and no air defense? 2. The weapon of choice against small mobile enemy units would be attack helicopters of the types Cobra, Apache and Black Hawk. Why are they not deployed in Kobane? 3. IS has brought reinforcements from Raqqa and the Aleppo countryside in long convoys of pick ups. Why were these not intercepted and attacked? 4. „Moderate“ FSA rebels, e.g. from the „Hazm movement“ have been extensively using american ATGMs (TOW missiles) against armoured vehicles but also against sniper positions and barracks of the Syrian Army. The FSA claims to side with the Kurds and against IS. 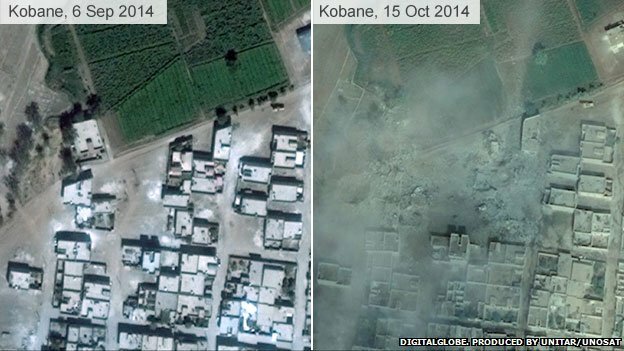 Why has not a single ATGM been applied against IS vehicles at Kobane? Readers all remember, when similar pictures are shown from Syria, western and (Gulf) arab press put the blame squarely on the Syrian army and used phrases such as „Assad is killing his people“. The „lesson“ is that while it´s OK for american fighter jets to demolish civilian areas of a SYRIAN city because of IS presence there, the Syrian army has no right to bomb civilian areas that have been taken by islamist militias and turned to launchpads for mortar attacks. Why is „Isis an Hour Away from Baghdad“ despite american airstrikes? The statements and findings of Cockburn are both baffling and frightening. How can it be that the best equipped airforce of the world does not make much difference against a lightly armed militia without airforce and almost without airdefense? In total ISIS is facing forces numbering 500.000 men but still manages to not only hold ground but also even to make gains. Now given this, what sense does it make to create yet another ostensibly „moderate“ Syrian Rebel army (lets call it „FSA 2.0“) with 15.000 men to fight ISIS when much bigger and better trained and more motivated forces have failed ( so far) even despite american air support? More than IS is losing men due to casualties from air strikes their ranks are replenished by fresh (international) Jihad recruits, a possible „joint venture“ or „reunion“ with Al-Qaedas Syrian branch „Al Nusra Front“ and further defections from other Islamist rebels. The idea behind FSA 2.0 reveals even more stupidity and lack of strategy when it is said that these forces after defeating IS will turn on the Syrian Arab Army and its allies, defeat them as well and thus „liberate“ Syria? The most battle-experienced and motivated major military entity in the Syrian war is the SAA with around 200.000 soldiers. In addition there are at least 50.000 National Defense Forces (NDF) and probably some further 20.000 loyalists such as the Arab National Guard and not to mention Hezbollah and Iraqi Shia militias, together likely to number 10.000. It remains a mystery how an artificially created relatively small force should enter the Syrian battle field and change the dynamics. The Americans are not seriously interested in an end of war and bloodshed in Syria because the Israelis and Saudis but also the Turks are opposed to it. If the US were sincere in their claimed desire for peace in Syria they would exert pressure on their Arab (Gulf) allies and Turkey to stop funding and arming the rebels and smuggling them into Syria. They would apply pressure on the rebels to attend peace talks without demanding ridiculous preconditions. So the Geneva conferences were doomed to failure and torpedoed in advance. The same will happen with the FSA series. The orginal FSA failed and FSA 2.0 will fail, too, but hey why not give it another try? And then another? Maybe FSA 4.0 will be ceremonially announced when 400.000 Syrians have been died. They claimed that the protests were entirely peaceful for a very long time. Some went so far to say that in the entire first year or at least in the first 6 months of the „revolution“ the „opposition“ stuck to peaceful means. Only after suffering continuously indiscriminate and disproportionate violence at the hands of the security forces, the allegedly secular/liberal/moderate opposition turned to violence as a means of self defense. „…up to 60 Syrian security forces were killed that day in a massacre that has been hidden by both the Syrian government and residents of Daraa. „April 10 was also the day when we learned of the first massacre of Syrian soldiers – in Banyas, Tartous – when nine troops were ambushed and gunned down on a passing bus. The BBC, Al Jazeera and the Guardian all initially quoted witnesses claiming the dead soldiers were “defectors” shot by the Syrian army for refusing to fire on civilians. That narrative was debunked later, but the story that soldiers were being killed by their own commanders stuck hard throughout 2011 – and gave the media an excuse to ignore stories that security forces were being targeted by armed groups. Then there is the myth of the „moderate opposition“. To this date major parts of euro-american mass media continue to uphold the bizarr claim that the armed Syrian opposition or at least the major bulk of the fighters, the so called „Free Syrian Army“ are moderates. „It is often suggested the “moderate opposition” is popular, democratic and secular. President Obama has recently proposed giving $500 million to the “moderate opposition”. „Contacted by telephone, Adnan al-Assadi, Iraq’s deputy interior minister, said Iraqi border guards had witnessed the Free Syrian Army take control of a border outpost, detain a Syrian army lieutenant colonel, and then cut off his arms and legs. Why is Iran supporting Hezbollah?